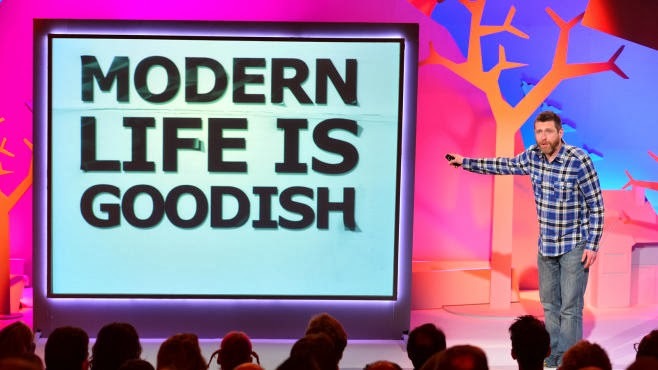 Now that Modern Life Is Goodish is being repeated (it's on Dave on Wednesday nights, just so you know) I'm getting a lot of tweets and emails from people about the show. The most frequently asked question is: will there be more. And yes. There will be. It's been commissioned for two more series. And series two is what I'm working on right now. TV is normally a very cautious business. TV people like to record 90 minutes and edit it down to 60 because they figure that way things will be okay if they don't work. 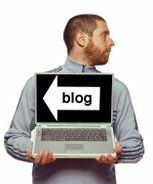 If you do things that way it means each bit of material has to exist as its own separate bit. And that makes things feel kind of, well, bitty. You end up feeling like you've had a series of snacks when what you wanted was a meal. I try to make shows where all the ideas join up. Often it's the way in which things are connected that's the point of it all. You simply can't do that if 30 minutes is going to get cut out of it later. So rather than doing stuff that might-or-might-not-work-and-it's-okay-because-we-can-fix-it-in-the-edit I try to just record a whole show that works. And so I try to do the editing in advance by road-testing the material in front of real audiences. Which is why I have a batch of warm up shows coming up. As you can see there'll be three shows in each venue. Each of those shows will be substantially the same - although I'll be making a few tweaks from night to night as I try to find the best way through that particular material. But the shows in Worthing will be completely different to the shows in Canterbury and so on... and they'll all be completely different to the tour that starts in October. Phew. I think that makes sense. I hope to see some of you there.